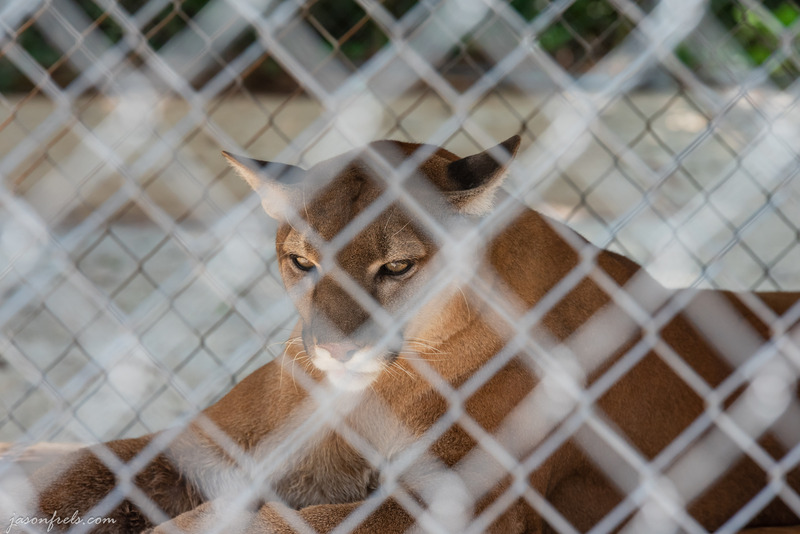 While at the alligator farm and petting zoo in Hot Springs, I also saw a cougar (also called a mountain lion or puma) in a cage. While this is a beautiful animal to see, it made me sad to see such an intelligent animal in a cage. I am sure an animal such as this experiences boredom and monotony in a way that the alligators and turtles do not. I tried to take a photo of this animal by blurring out the fences in between us. I zoomed all the way in and got as close to the cougar as I could to limit the depth of field. I think that the foreground fence blurred nicely. I also think that I captured the cougar in a fitting pose. If I had remembered, I would have chosen a much lower ISO, but this was in good light and there is no noise in this photo. That’s what I have for a Saturday morning photo. I’ve been doing a lot of driving, dodging tractor-trailers on the Interstate Highways and it will be nice to be back home and start sorting out my pictures and everything else. Thanks for reading and please leave a comment below. Agreed, the fences in the photo make a powerful statement I think. It definitely does, it really hit me, this shot. Thanks for sharing and for stating your opinion on it as well! When I took this photo, I was thinking that maybe I could get the cat’s face clearly through the fence if I tried to blur the fence. When I looked at the back of my camera, I knew I had a keeper that told more of a story about the animal. Thanks for the comments and for stopping by.